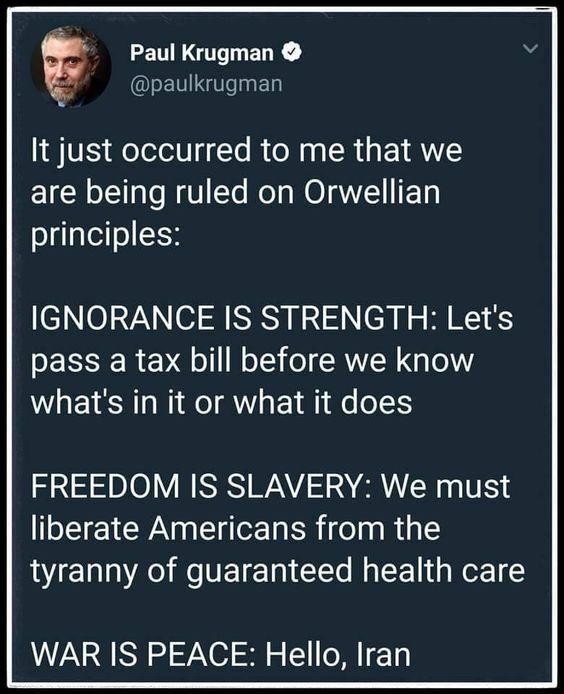 Where was Krugman when Pelosi said “We have to pass this (Obamacare) bill to find out what’s in it?” The hypocrisy of Democrats and Liberals is evident every day. And, speaking of health care, I’ll be grateful when I’m liberated from the tyranny of having to pay for the healthcare of illegal aliens and people who made the conscious decision to ruin their health by smoking, consuming alcohol and doing drugs; oh, and it’ll also be nice not to have to pay for pregnancy care even though I’m a man. Thanks for the response, GUY. No party has the monopoly on hypocrisy, that’s for certain. And I am glad to understand that you are able to fully take care of yourself. Not many are in perfect health and can stay that way until they drop over into their grave. And from the sound of it, you have no wife or children. You sound pretty self-contained and self-sufficient. Good for you. It would be a better world if everyone was a well off as you are.